Finally! Let the Christmas posts begin! I have several to churn out for you in the coming days. Most contain a blend of phone, purse and big girl camera photos. Basically I picked up whatever was near and now all three are caked with flour and smell of cinnamon. I’ve let you in on my family’s biggest Christmas Eve tradition. The highlight of my day was when I got my grandma–on the phone! 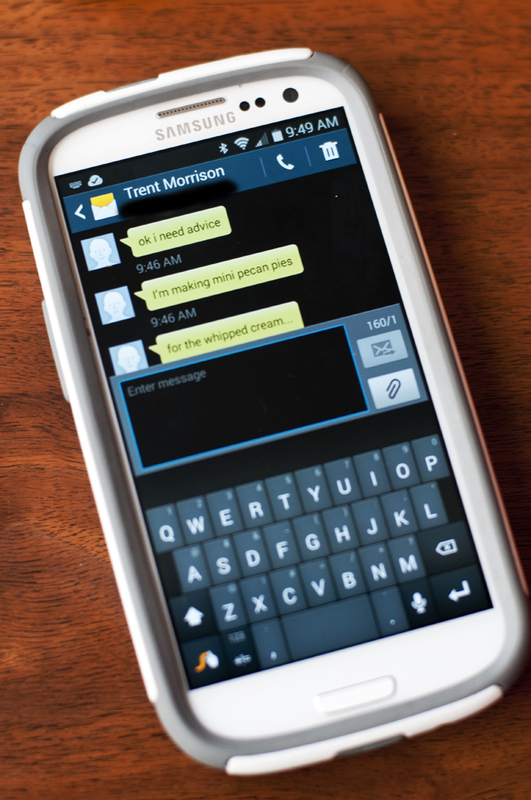 In the age of caller ID and texting and social media! I got her OLD SCHOOL! That never happens. Sorry, I just had to relish in the victory once again. Pepperoni Rolls and Lemon Bars. 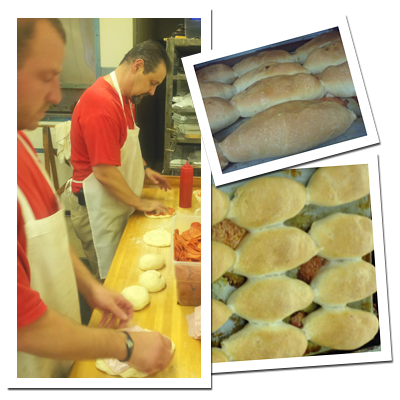 There is an old bakery in Southgate, Michigan that makes the most delicious pepperoni rolls. It’s tradition for his grandma to pick up several on Christmas Eve for the family to devour before her choir service downtown. Sweet traditions! 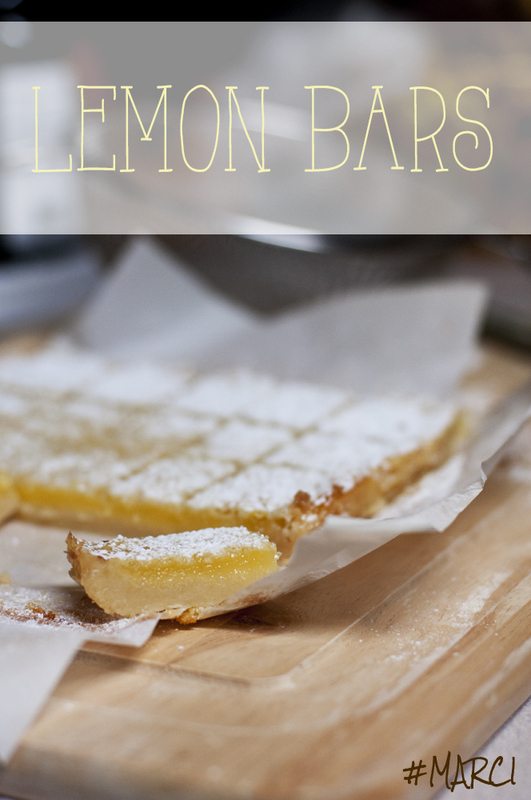 I’m not sure where the lemon bars fit in, but I’m not one to question favorite foods. I haven’t had much luck with yeast dough in this altitude–a point I will revisit in another post when I discuss another holiday tradition….cinnamon rolls. So knowing that, making my own pizza crust was out of the question for the time being. 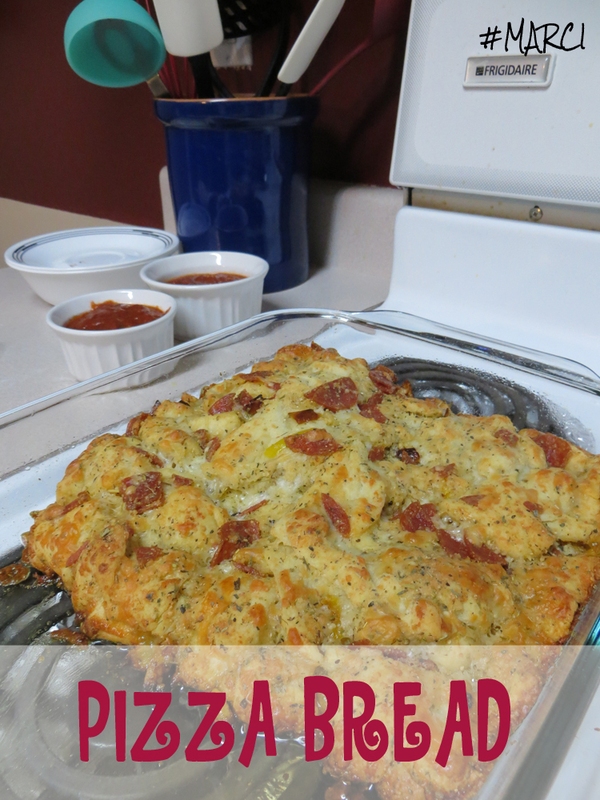 I found a bunch of ideas on Pinterest that I melded into my own for this delicious Pull-Apart Pizza Bread! 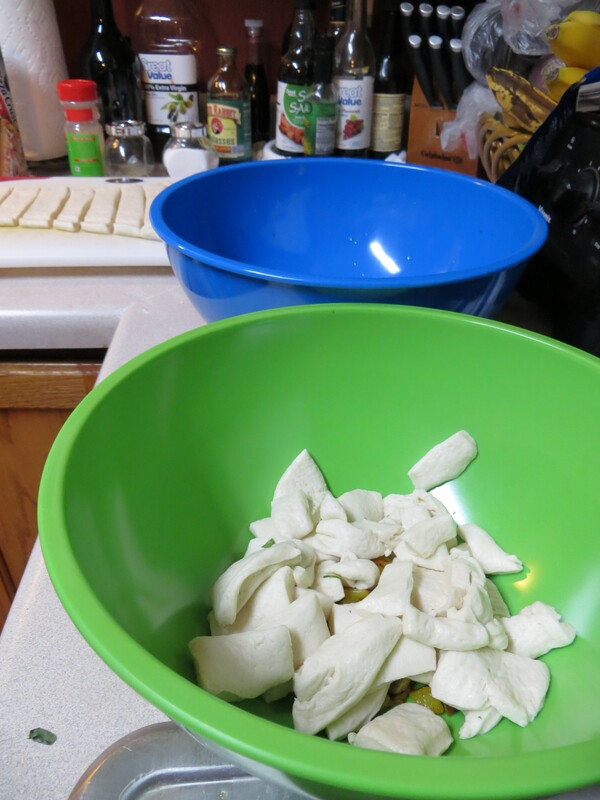 You start with canned pizza dough (for shame!). Unfold it (no rolling required) and cut into little squares. 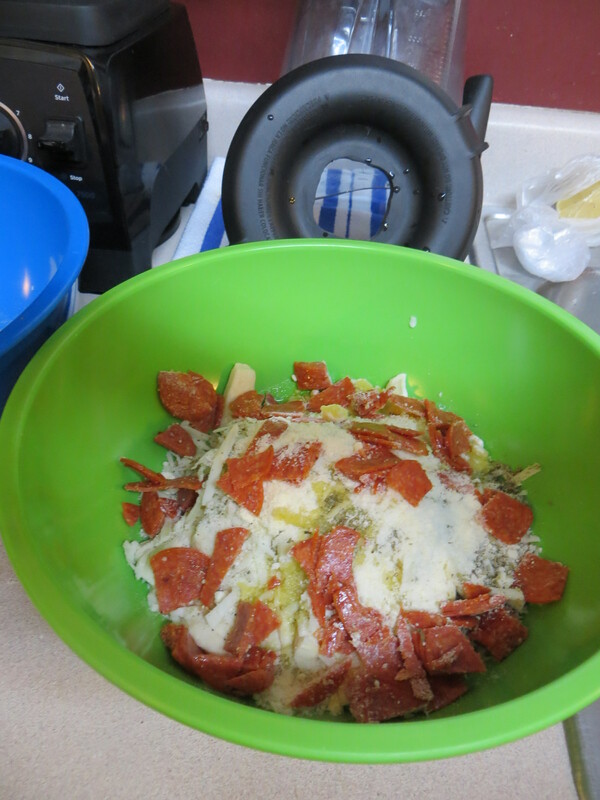 The recipe I MacGyvered called for two cans of dough, so it was really easy to make a pepperoni version for Joe and a garlicky spinach and yellow pepper version for moi. Mix it all together and spread in a bundt pan (sprayed REALLY well with non-stick spray), or be lazy like us and put in small casserole dishes. Joe used a larger pan, so he only used half of the pan. You want the mixture to be tight so it forms a big, bubbly, rip-it-apart mass. Yum. The smell alone would knock you out. 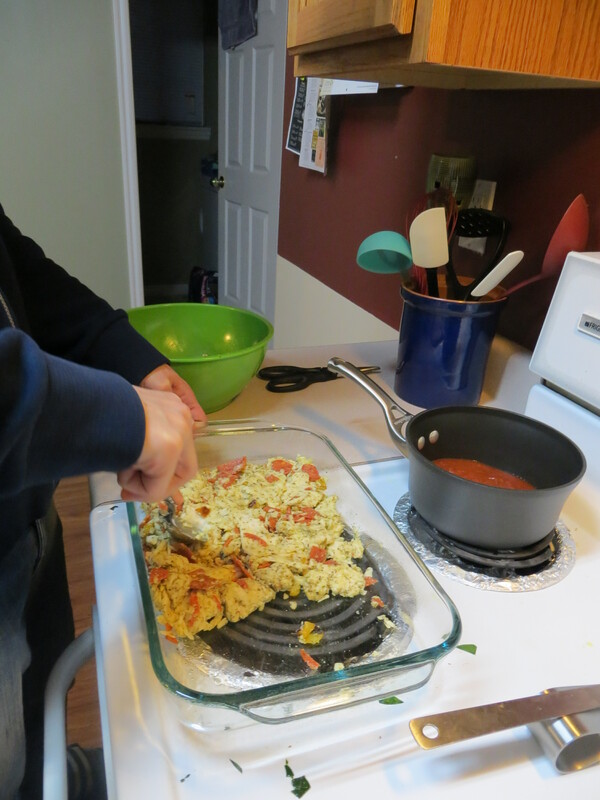 And it makes a ton — we ate this for several meals afterward. Paired with a salad, even, this could take you far in your weekly meal planning. We warmed up some jarred marinara for dipping and it was quite the perfect meal. Especially when paired with my Christmas tradition–National Lampoon’s Christmas Vacation. 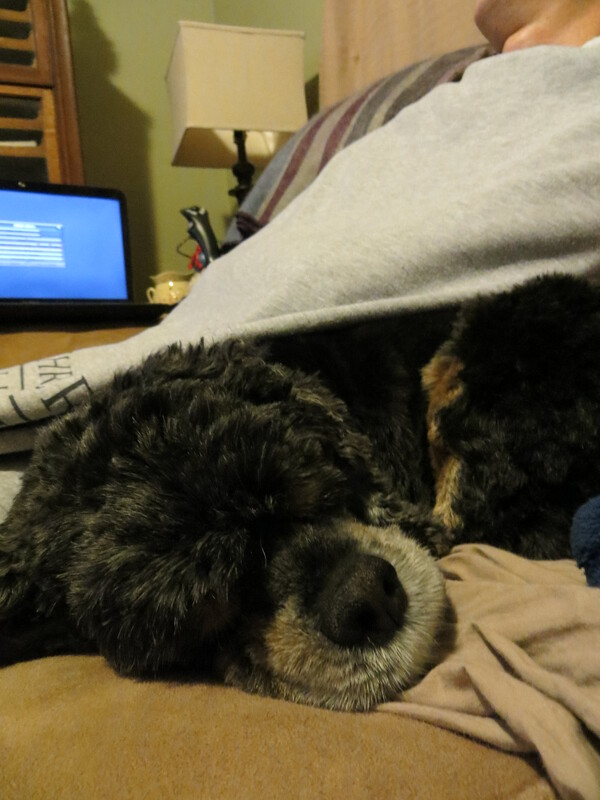 Which, upon watching, Joe and Bella quickly fell into soft snores. But guess who woke up pretty quickly for dessert? Really, you could say either name and you’d be right. 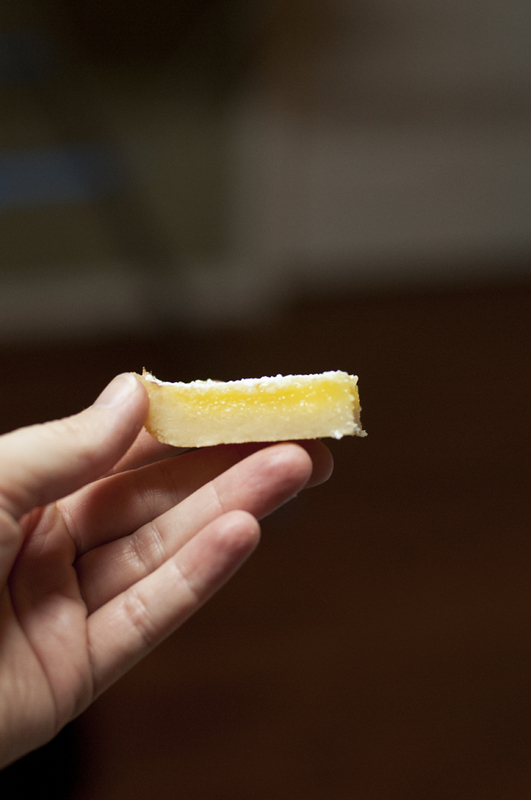 I have never made Lemon Bars. 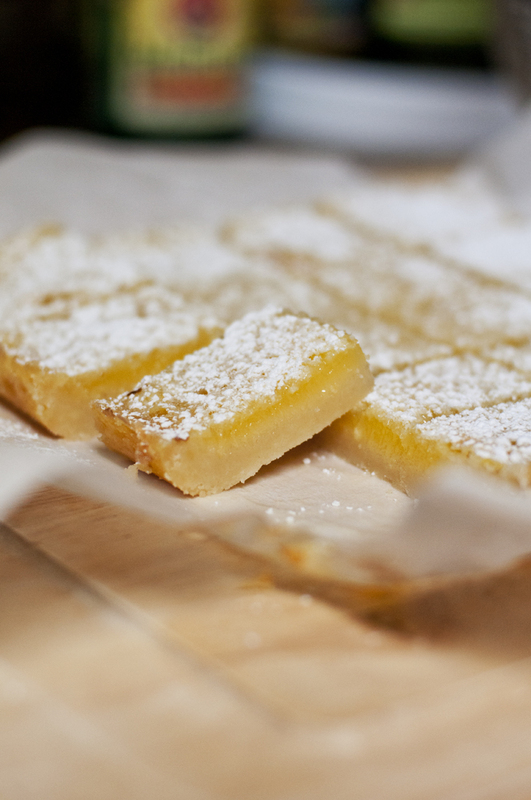 They aren’t my favorite dessert because they are typically cloyingly sweet and, often, completely overwhelmed with powdered sugar. But, tradition’s tradition. I knew Joy would be my go-to girl and, as expected, she didn’t let me down. I actually made the bars the night before. My first item in a long list of baking adventures planned for the week. Just getting out the mixer that I knew would be sitting on my counter and responsible for four or five doughs gave me the giddies. In other news: Parchment Paper for President! 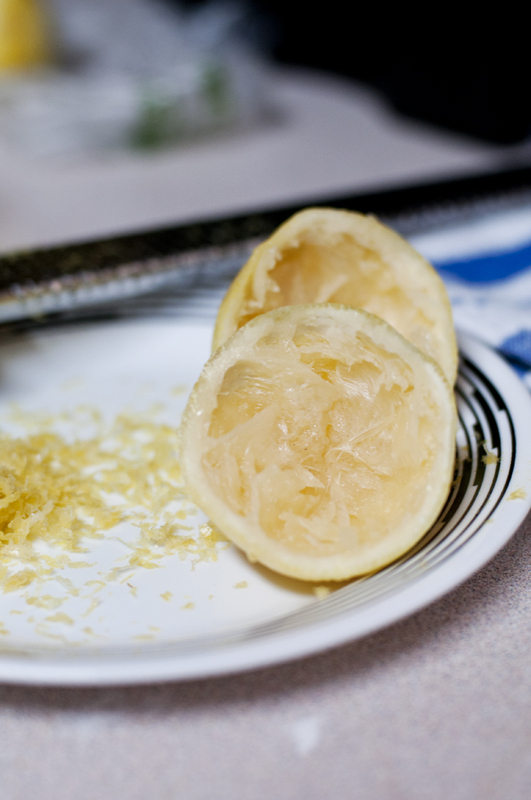 In other, other news: Don’t break your lemon reamer when making this. But do get every last drop of juice! I may speak from experience. 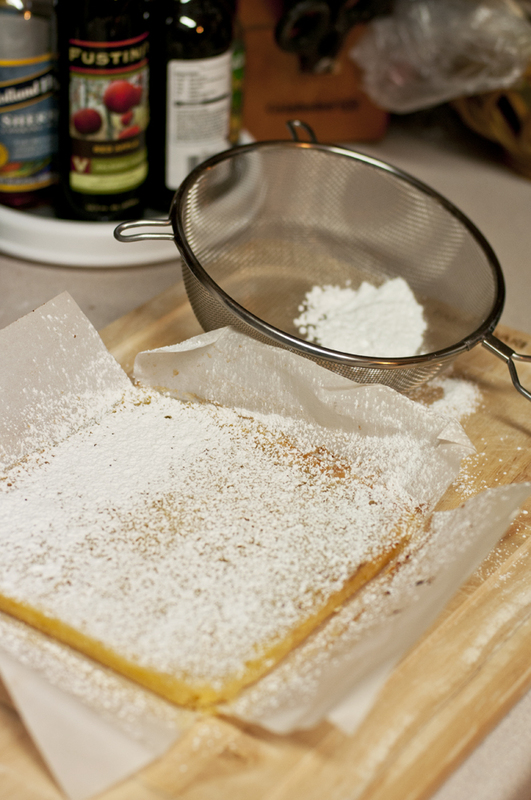 When you’re ready to serve, just pull on the overlapping parchment and make it rain snow with that powdered sugar. I didn’t go too crazy, but obviously you can lay it on pretty thick if you want. I don’t know why, but I thought the bars would be puffier or thicker. This just shows my lack of experience with these things. Joe assured me they only needed three components: thick crust, gelatinous (ew!) yellow center and the powdered sugar topping. Guess we nailed it. It’s important to cut these small. 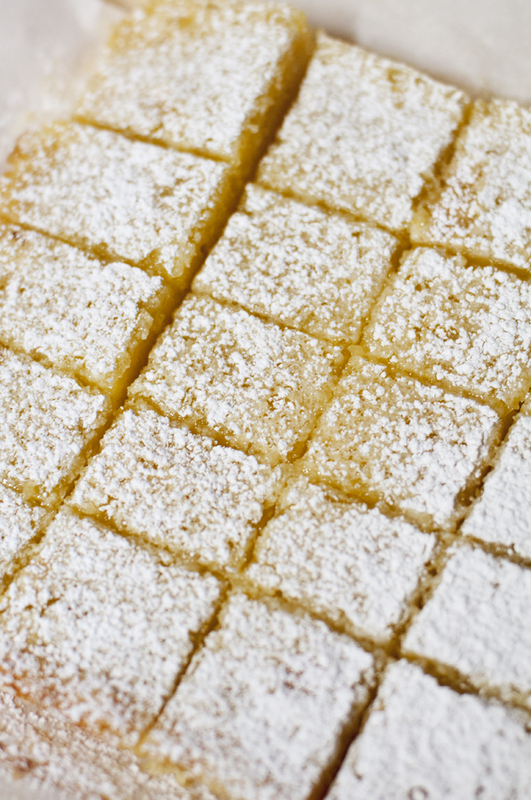 They are SUPER sweet and SUPER DUPER tart, so a little goes a long way. Pre-heat the oven to 350-degrees. 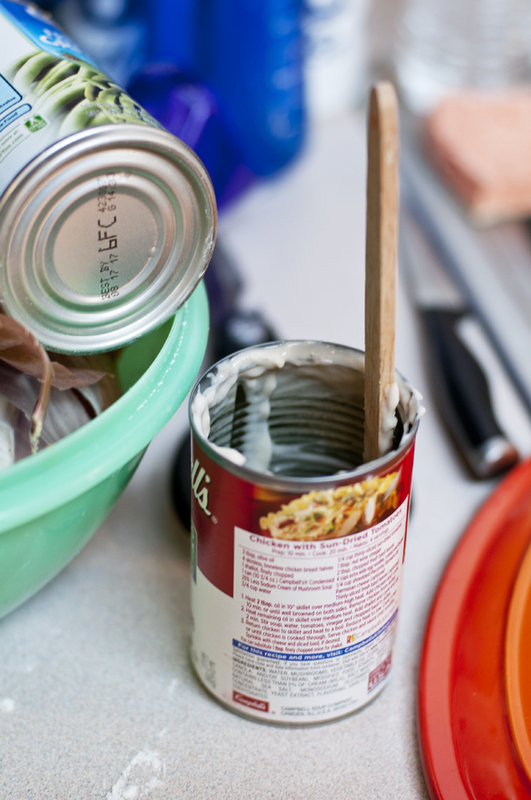 Remove dough from cans and cut into small squares. Mix well with the cheeses, spices, oil and whatever toppings you choose. Spread into a small casserole dish or non-stick bundt pan and bake for about 30 minutes. Warm marinara sauce over low heat while cooking. Eat immediately while warm and gooey. Place rack in the upper third of the oven and preheat to 350-degrees. 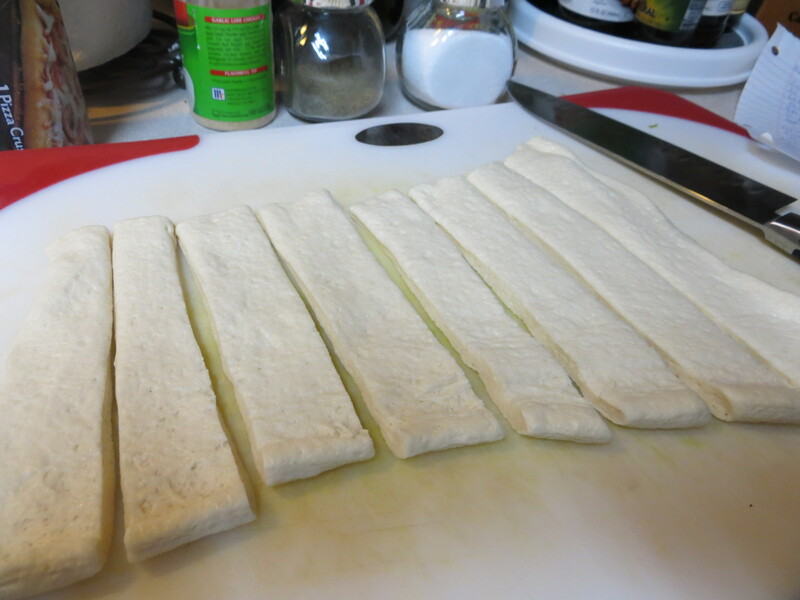 Butter an 8×8 baking pan and line with parchment paper so that two strips overhand all sides. 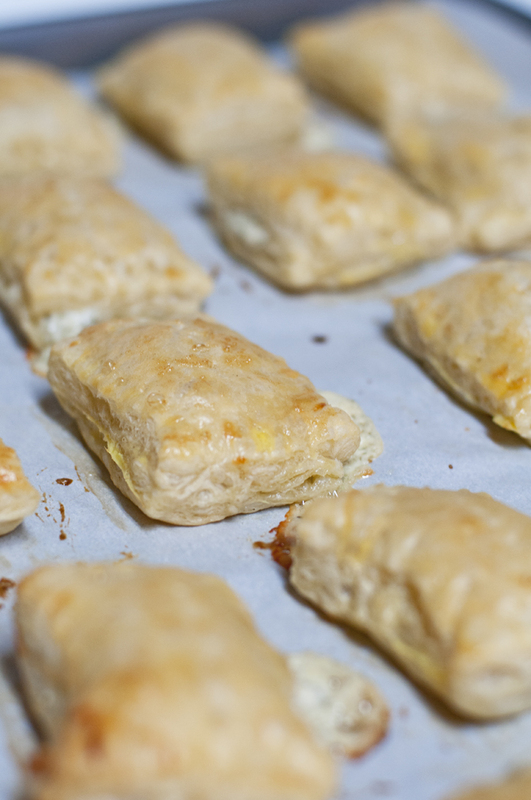 Butter the parchment paper while you’re at it. 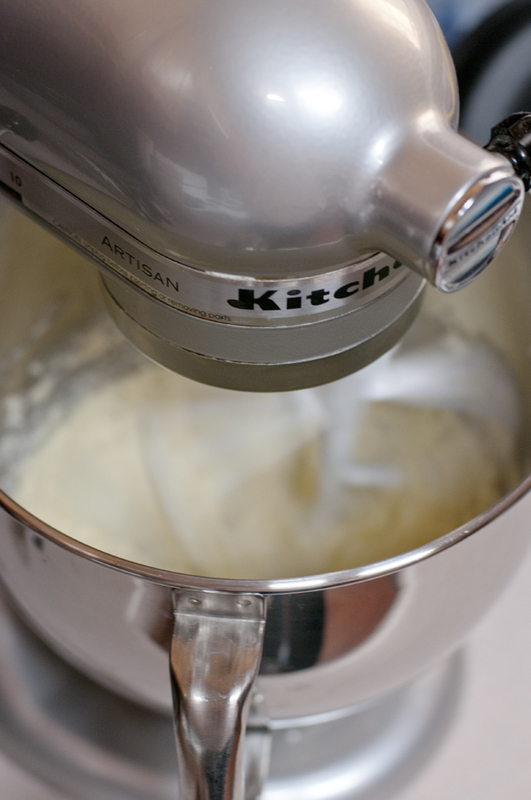 For the crust: In the bowl of a stand mixer fitted with the paddle attachment, beat butter and sugar together until light and fluffy (3-5 minutes). Scrape down sides of the bowl before adding flour and salt. Then beat on low speed until incorporated. 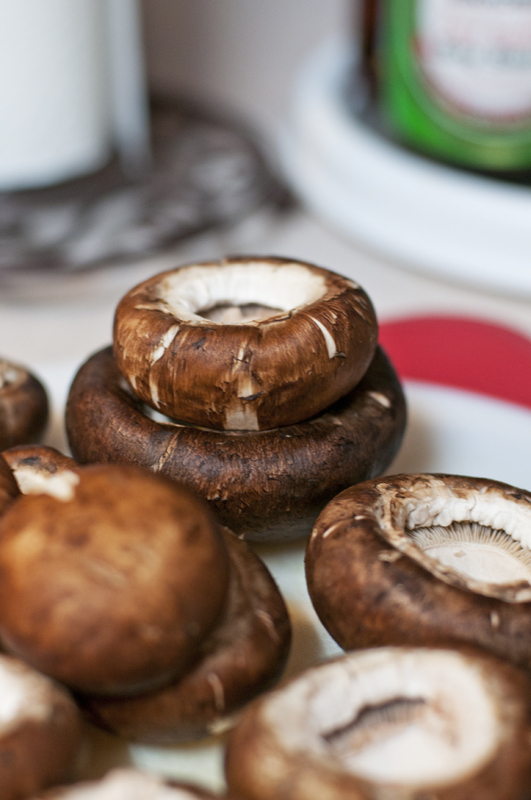 Dump crust into prepared pan and, using your fingertips, press it into the bottom of the pan. 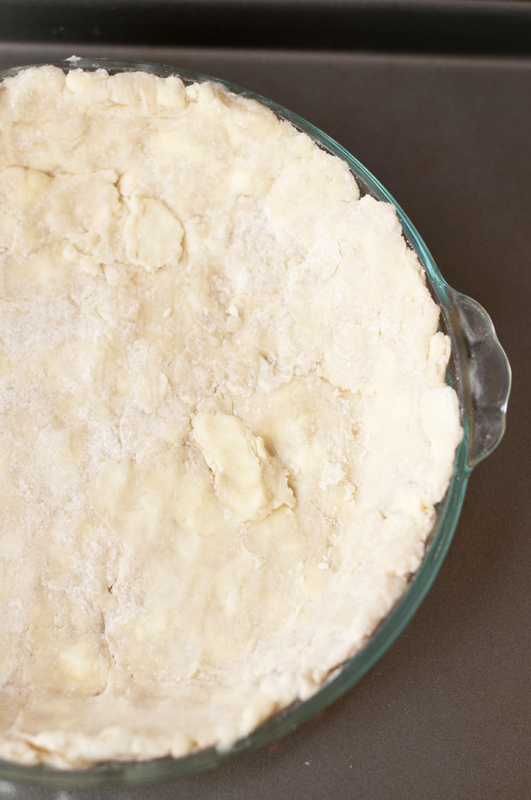 Bake crust until it is just browned around the edges (15-18 minutes). Let cool slightly. For the filling: In a medium bowl whisk together the eggs and sugar until well combined and slightly thick. Add the flour, lemon juice, and zest and whisk well. Pour filling over the warmed baked crust. 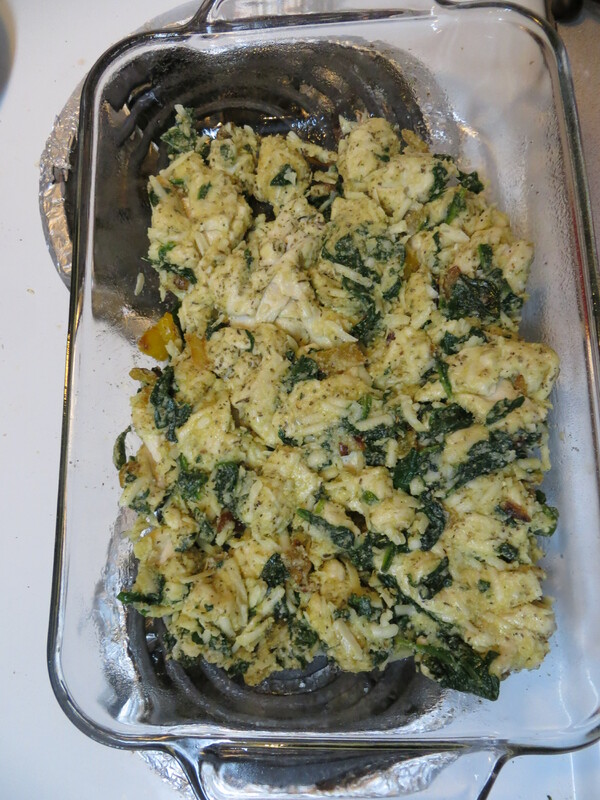 Return pan to oven and bake until lightly browned on top and no longer jiggling in the center (18-20 minutes). Let cool completely in the pan. 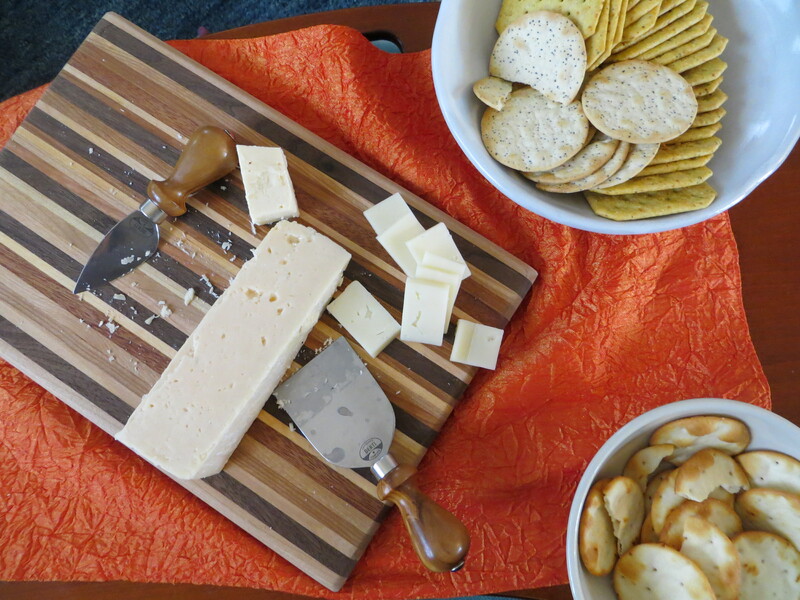 When ready to eat, lift out the bars by the overhanging parchment tabs and slice into small squares. 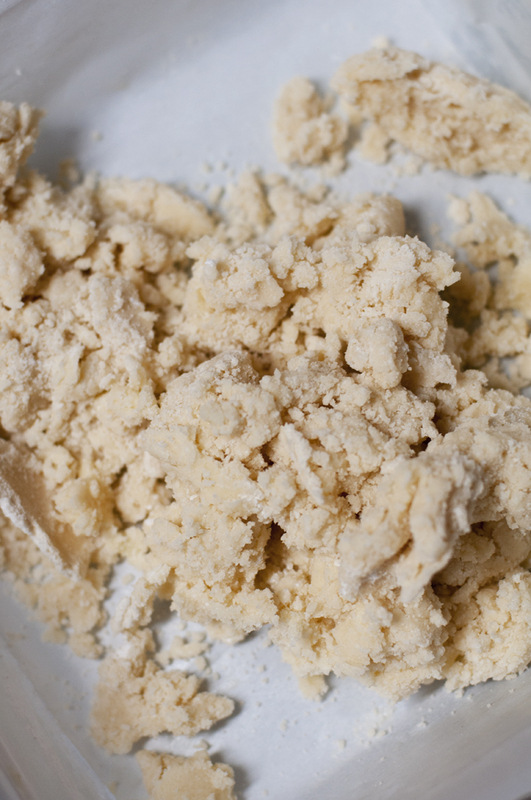 Dust with powdered sugar and keep in an airtight container (layers separated by wax paper) at room temperature for up to a week. Guys, it’s Friday. I’m guessing most of you knew this all day, but it didn’t cross my mind until Joe asked me what day it was. Holidays tend to do this to you, I guess. 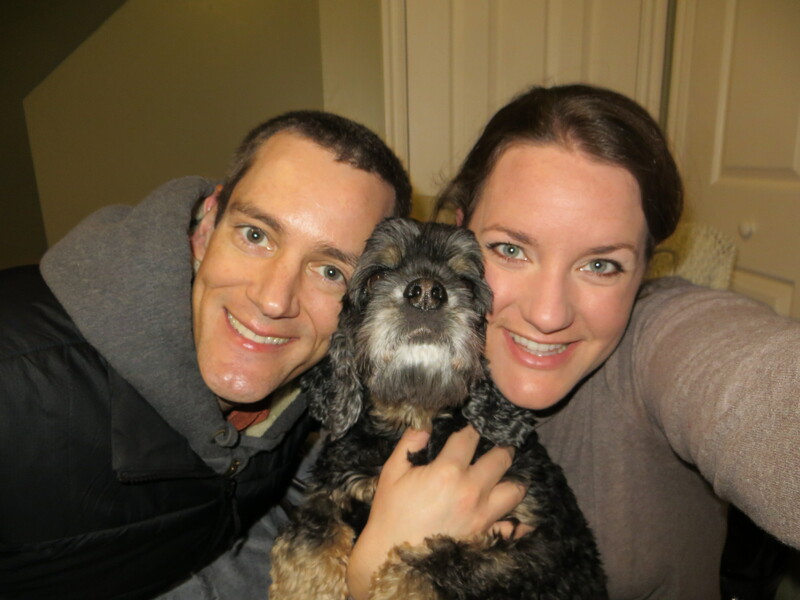 I had plans for this post–the last Friday Five of 2014. I wanted it to be a round-up of all things good, wonderful, hard and trying about the last year. A survivor’s tale. We have enjoyed the last few days so much–skyping with family afar, spending Christmas with dear friends and all of our favorite foods. 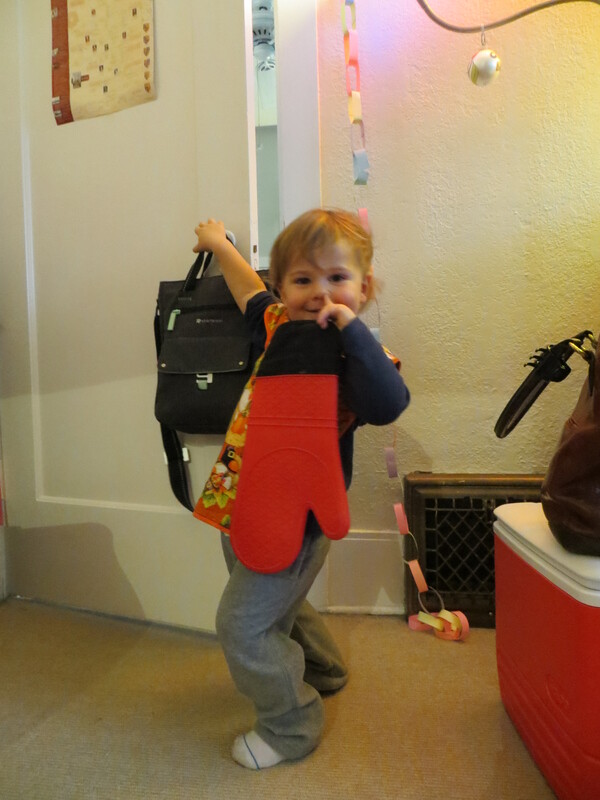 So much to tell you about, but for now I want to let you in on the theme of this year’s Christmas gift-giving. My family didn’t need this blog to understand and appreciate my/our obsession with food, but they clearly know how to give the right gifts for people like us. These novelty items will be gracing our tables and tray tables for years to come: wavy platters (perfect for Christmas cookie trays); ceramic bowls for snacks, dips, etc. ; “Foodie Fight” — a trivial pursuit game for Foodies (#us); cute dish towels; and Cherry Bombe — which I also can’t wait to share with you! Let’s get right down to it and cut out the cooking part with these jewels: crazy marshmallow sandwiches in amazing flavors; homemade caramel corn; “Elvis spread;” oil and vinegar pairings. Just stuff my face now! Always. This is a foolproof option for me, and I’m happy to add these to my collection: Aarti Paarti (Indian food, yesplease! ); and the definitive guides to both Mac-n-Cheese and Grilled Cheese. Dinner planning just planned itself. The tricks of my trade just got a lot easier thanks to these guys: a new (incredible) blender; whisks; ice cream scoops; extra ice cream drum (because making one flavor is NEVER enough); cake decorating set; and a new spatula. Whew! 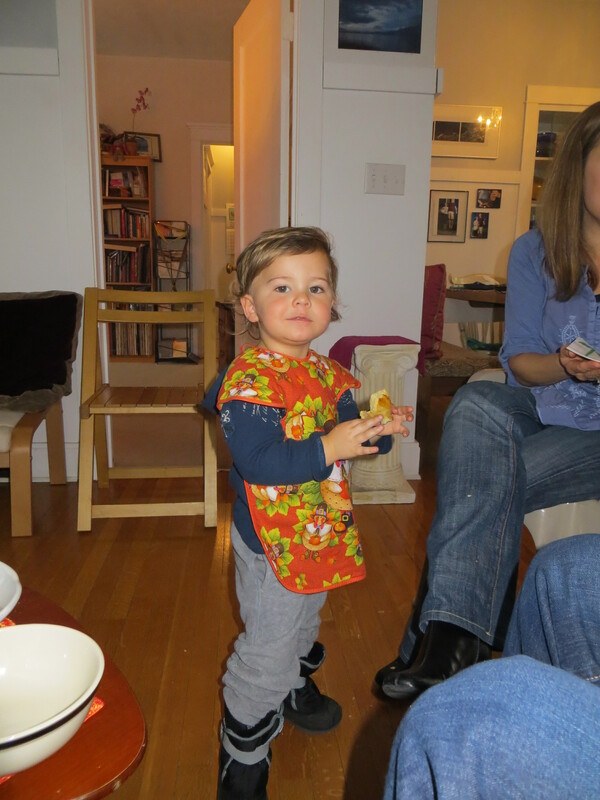 Our hearts and our stomachs are so thankful for the wonderful, thoughtful gifts. You know you, as blog readers, will get to see all of these items in action. Grateful for another generous Christmas and the joy of cooking, baking and eating. More soon on all of our holiday happenings. 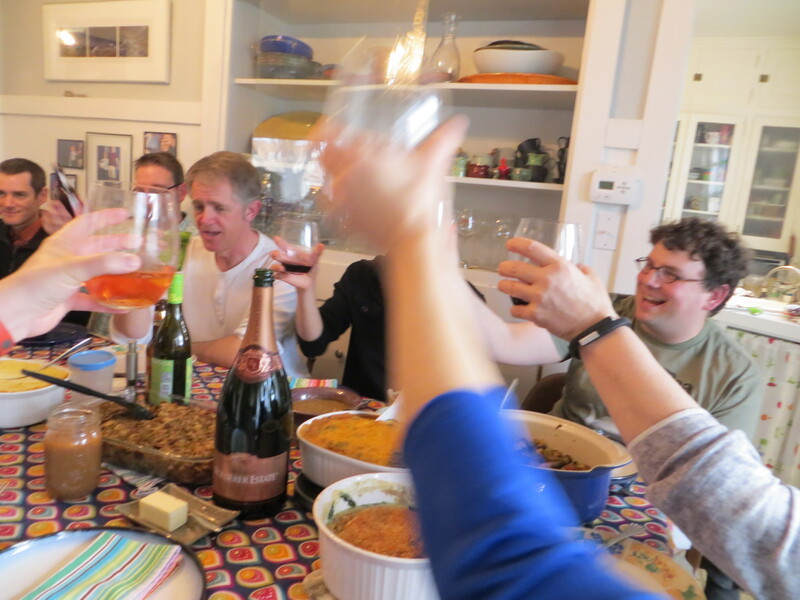 Hope you all had a wonderful week — and HAPPY EATING! 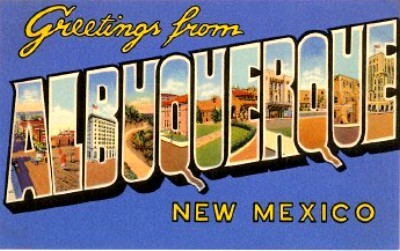 Joe is in ABQ getting ready for tomorrow’s bowl game. Tune in to ESPN at noon (mountain time) to *hopefully* see them in action! Right after the game ends, they’ll jump on the bus and head back to Utah. It was a short trip for them, but I’m ready to have him back. I’m 90% finished with a second-hand desk I have been working on in the garage. It’s time to bring it up to the office (with the help of my OGE friends tomorrow) and get my real work station set up. This is exciting, but still a bit stressful. This will get its own post soon enough! This is the fun part. After last week’s post, I have finally narrowed down which cookies I’m going to make, but of course there’s Christmas dinner, Christmas Eve dinner, and holiday breakfasts to think about too. I promise to not wait a month to post the details of these meals like I did for Thanksgiving! There’s so many little things I need to accomplish so the break can truly feel restful. I’m going to be crossing off my to-do list like Santa moves names to the naughty list–fast and furious. These tasks are nothing too exciting; just a bunch of cleaning, a few errands and a dog bath stand in the way between me and the sleeping, eating, reading and movie-watching we’ll be doing in just a few short days. Bring, It. On. Enjoy the last holiday rush before next week! Hello, my name is Marci and it’s been 13 days since I’ve had a piece of this pie. I know this, because my stomach has counted the hours…pining for its rich, creamy bite. 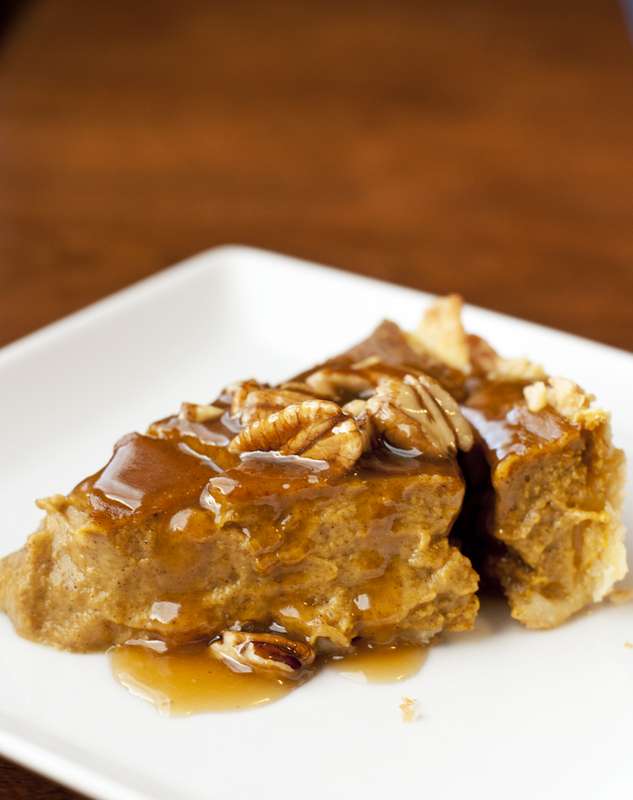 Surprisingly, my Thanksgiving obsessions have never included desserts. My focus has always been on the cheese and the sides, but Joe has a favorite. 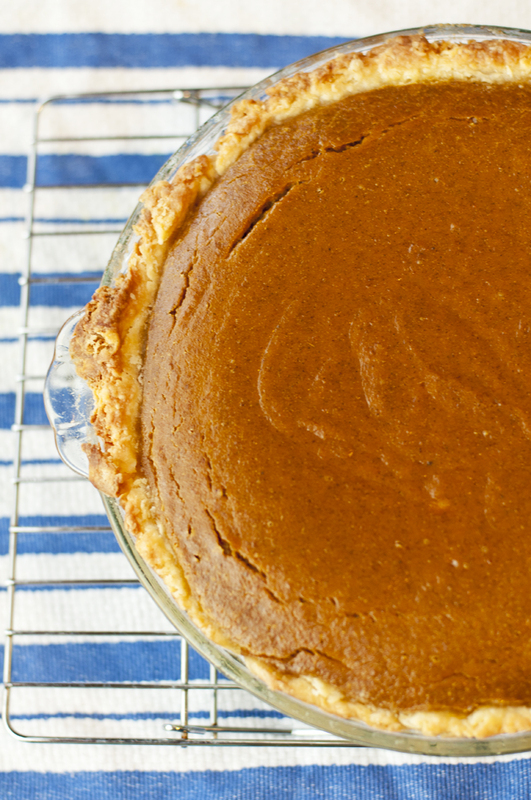 The traditional Pumpkin Pie. I’ve avoided making pies at high altitude as much as possible. There was this summer fare that cheats with frozen crust made into cinnamon rolls, so it didn’t really count. But Joy makes me feel like I can do anything in the kitchen, so why not? Let’s make the boy some pie. Sometimes I read over recipes and already begin reworking them in my head. “Oh, I don’t need to buy that ingredient…how much of a difference could it possibly make? I’ll just use X, Y, Z.” Do you do that too? I’ll admit that I totally had that internal convo when looking that this recipe, namely when I skimmed over the word cardamom. You only need a fraction of a teaspoon and it can be pretty pricey, so I had already written it off when Joe reminded me that the bulk aisle at our store carries cardamom. I could get a minimal amount for $1 and be on my way. This is why I married a total smarty pants. It’s here that I will plead with you to find cheap cardamom, however you can, because you will NOT want to make this pie without it. Its ¼ tsp. 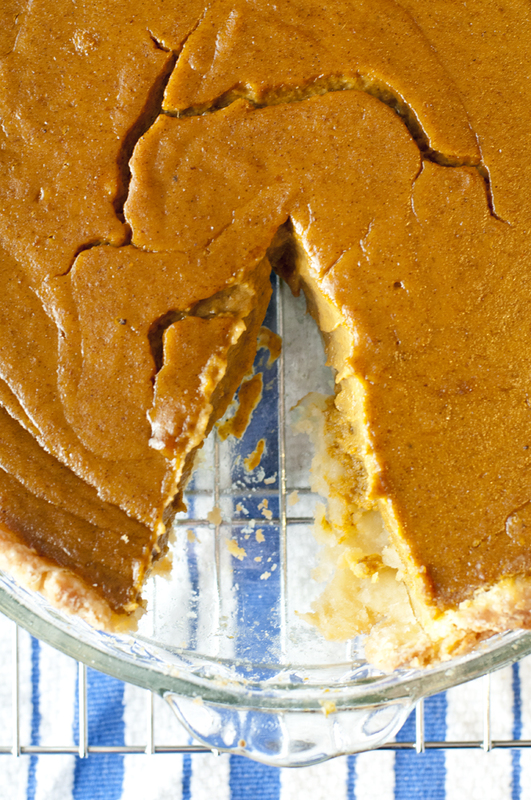 emits the most incredible floral flavor into the pie, which makes the pumpkin blossom into sweet heaven. I’m not joking. This is where baking meets the divine. Trust me. As good as the filling was, my crust definitely lacked pizazz. I now know that high-altitude crusts need more liquid. So, yeah, I’ll work on that for next time. The filling, as I mentioned, was where the party was happening. I loved seeing those flecks of spices, revving up each slice with maximum flavor. I said a quick prayer, and encouraged you all to do the same via Instagram, and threw it in the oven. When the jiggles were gone, I was pleased that there was just one crack, but as Joy promised, the pie settled and cracks became craters. That’s okay. 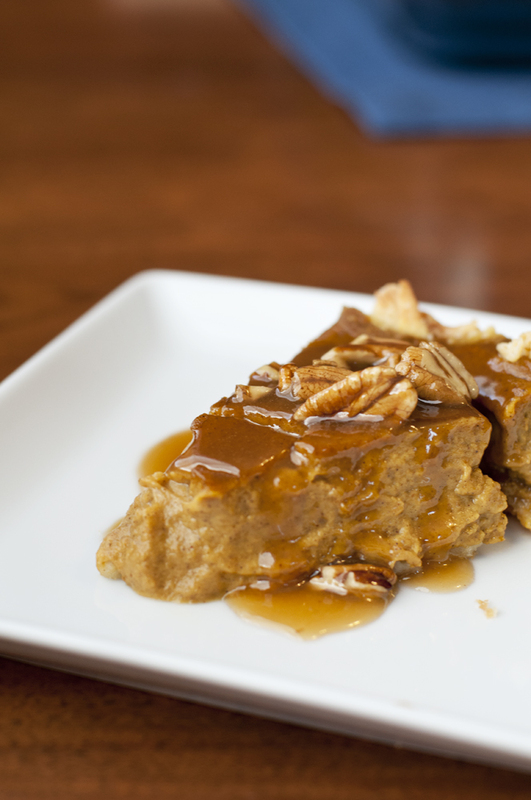 Pumpkin pies were made to be rustic. (Filed under Things I Tell Myself to Feel Better.) Here’s how I went from “OHEMGEE, no cracks!” to “oh, wait….” in a matter of minutes. 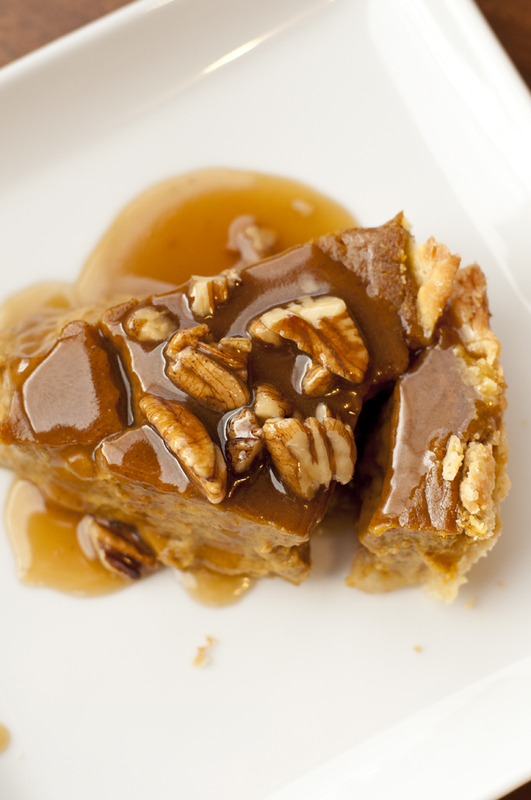 Every piece of pie should be blanketed with a warm, sticky caramel filled with crunchy pecans. 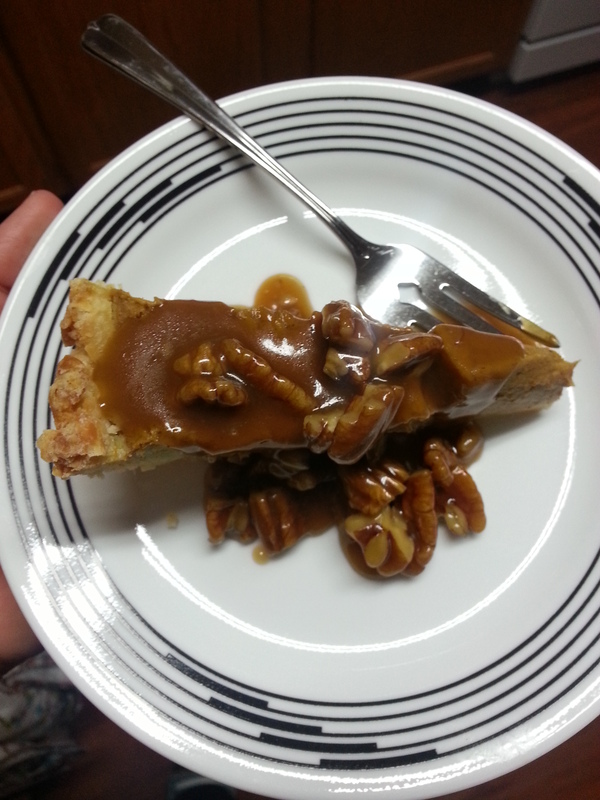 It was so good, in fact, that I made a double batch: One for the pie, and one to pour over our Thanksgiving ice cream. Really, there are few things in this world that would not benefit from this sauce being poured on top. If the filling was the party, this topping was the more-exclusive after party. It’s unfortunate that I’m the most impatient person when it comes to baking, because my pie really needed to chill before I sliced it, much less photographed it. These pictures make it look mushy and under-cooked (not to mention that huge crack, but I assure you it was perfection. These phone pics, ironically, show the final texture better….which is still a little hard to see because I insisted on drowning each slice in sauce. But, it’s there and it was sublime. 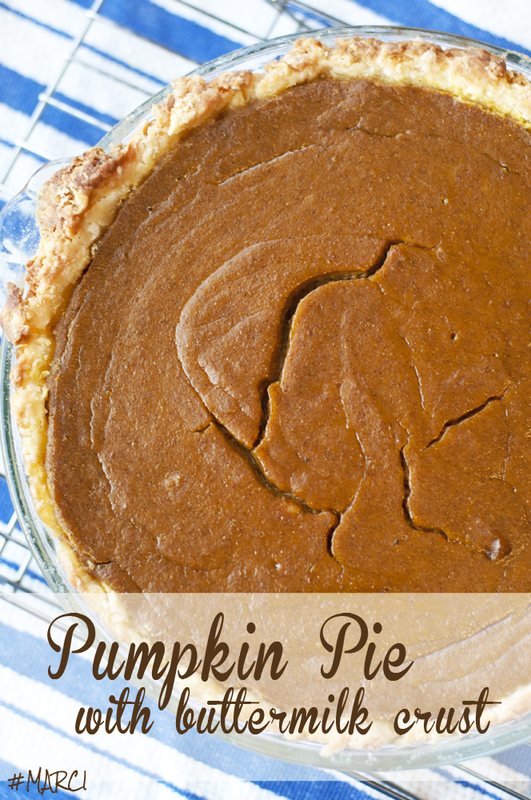 Now that we’re way past Thanksgiving….make this! Haha. In a bowl, whisk together the flour, sugar and salt. 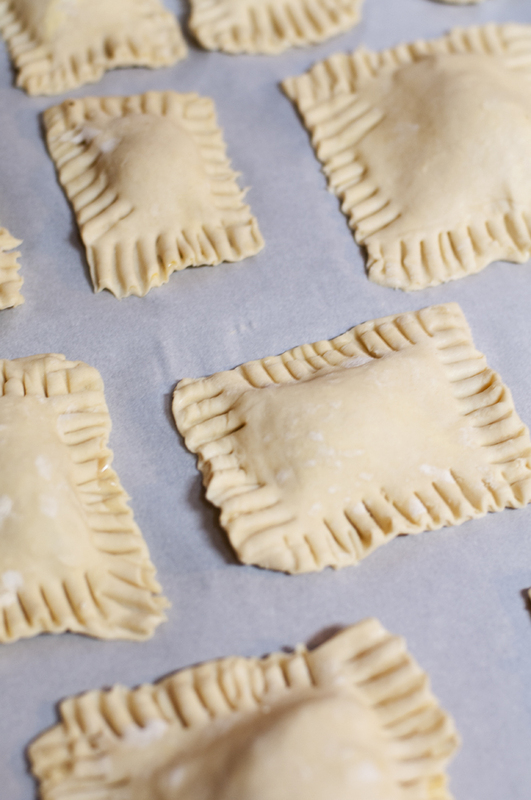 Add the butter and, using a pastry cutter, quickly work into the flour mixture until butter pieces are the size of peas (some will be larger). Make a well in the center and pour in the buttermilk. Using a fork, stir until the dough forms. 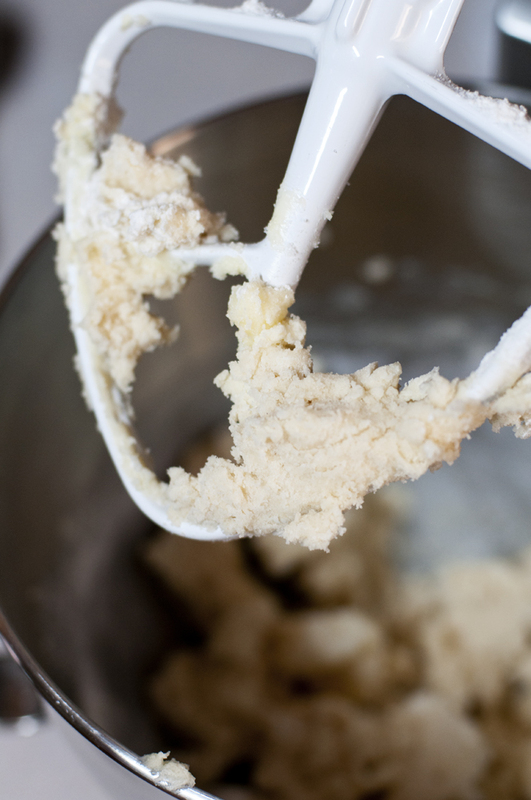 Turn the dough onto a floured surface. Wrap in plastic wrap and refrigerate for one hour. After the hour, turn out crust on a well-floured surface and roll to 1/8-inch thickness, about 12 inches across. 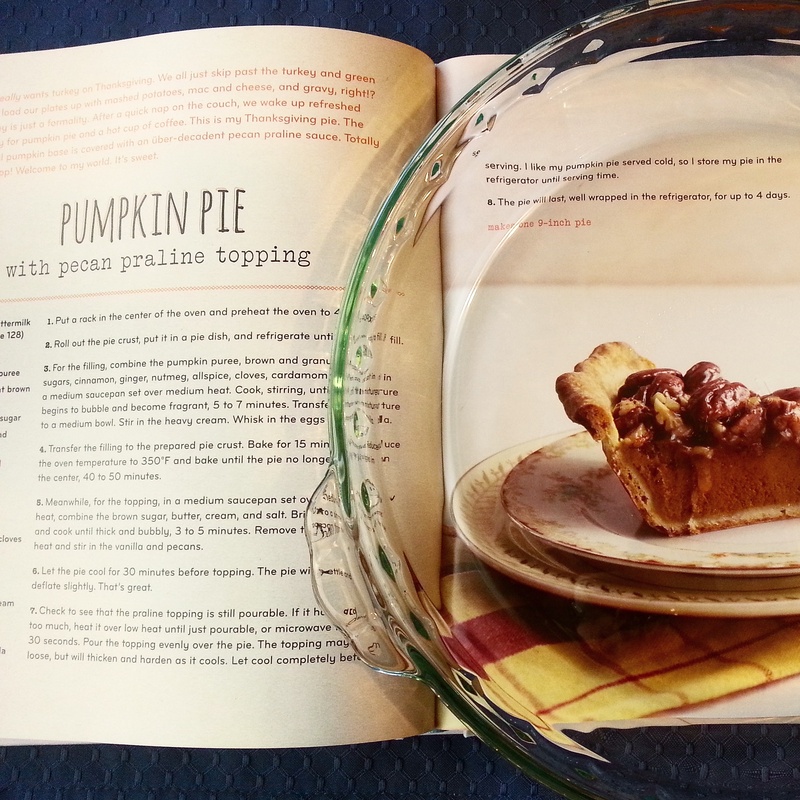 Transfer to a pie plate and fold or trim the edges. Cover with plastic wrap and refrigerate for at least 30 minutes or up to 3 hours. Place rack in center of oven and preheat to 400-degrees. Combine pumpkin, sugars, cinnamon, ginger, nutmeg, allspice, cloves, cardamom and salt in a medium saucepan over medium heat. 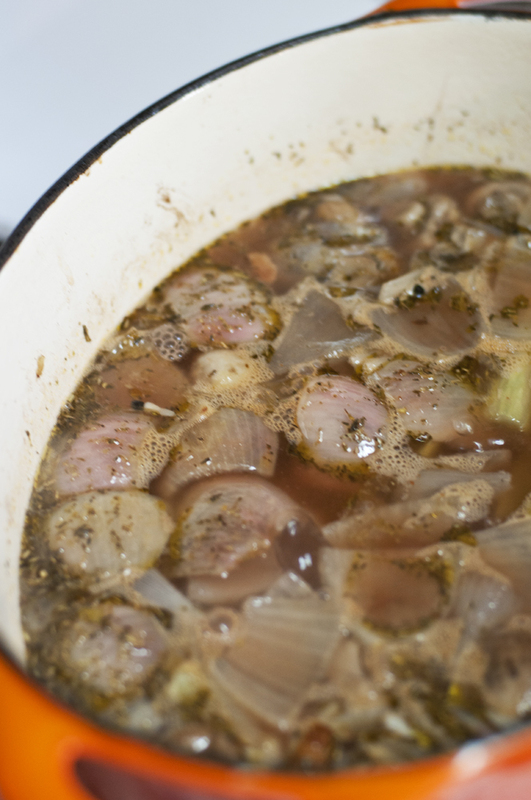 Cook, stirring, until mixture begins to bubble and become fragrant, 5 to 7 minutes. Transfer mixture to a medium bowl. Stir in heavy cream. Whisk in eggs and vanilla. 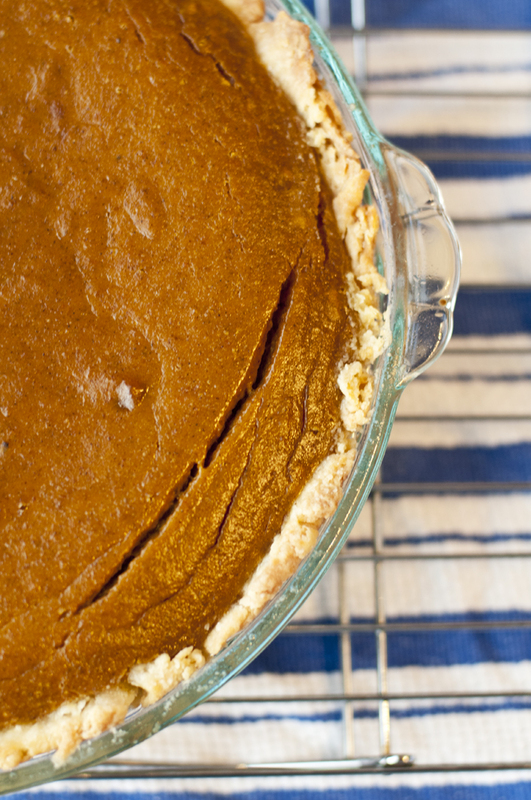 While pie bakes, put brown sugar, butter, cream and salt in a medium saucepan set over medium-low heat. 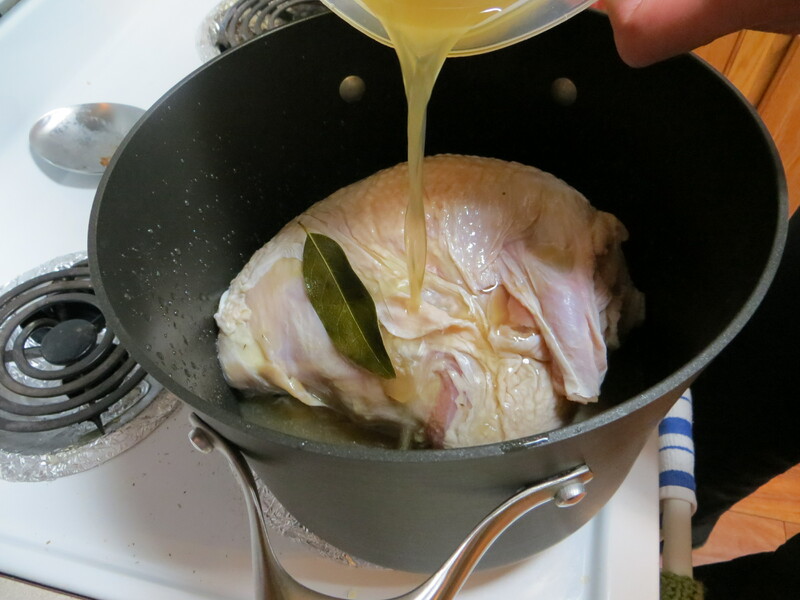 Bring to a simmer and cook until thick, 3-5 minutes. Remove pan from heat and stir in vanilla and pecans. Set aside. 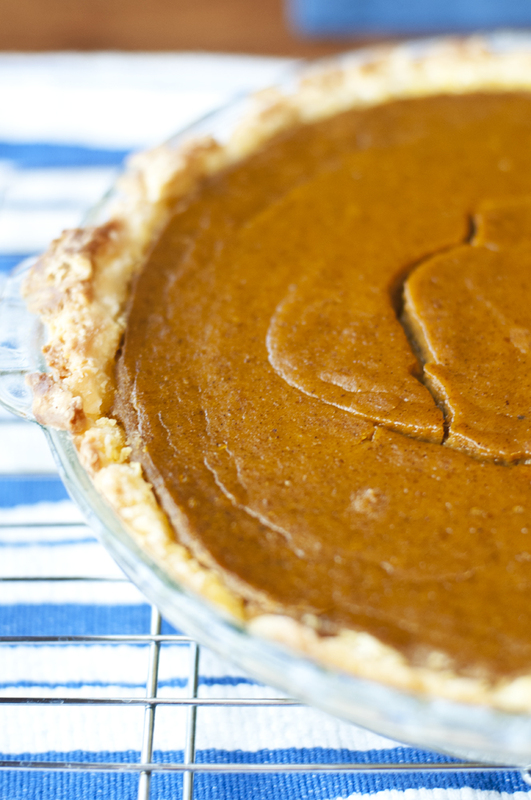 If the topping hardens too much when pie is ready, microwave for 20 seconds until pourable. I recommend storing in a mason jar for easy pouring and reheating. The Holiday Baked Goods Table. The Christmas Cookie Tray. It’s the card table set up in the back room with decorated tins filled with layers of treats divided by wax paper. It’s the iconic Tupperware filled to the brim with cut-out cookies in—mostly–recognizable holiday shapes, loaded with sprinkles. It’s the holly-and-red-berried platter with samples of confections that sits out all day, every day roughly between December 20 and 27 with an ill-fitting piece of saran wrap thrown on top. Holiday baking is as essential to the season as stockings, trees, ornaments and carols. It’s just not Christmas without it. But, it’s very hard for me to get in the spirit when staring down dry, uninspiring cookie assortments. You’d think the dessert table would be my safe haven, but surprise! Give me a plate of my mom’s sugar cookies or my aunt’s cranberry orange butter cookies and I’m all set. But that’s the extent of it. *Shortbread with jellied centers – just say ‘no’ to Linzer! *Anything with dates. Just stop. *Anything doused in powder sugar. We get it — it looks like snow. *Any “Italian cookies” – Italians do a lot of things right, cookies just aren’t one of them. *Biscotti – Biscotti are not cookies! Stop trying to make them legitimate desserts for those who don’t drink coffee! Do you see the recurring theme? Dry. Chalky. Powdery. No. No. No. I need soft. I need plump and M-word and gooey in my holiday desserts. As you can see, I feel pretty strongly about this. It’s a solid stance built on 32, soon to be 33, Christmases. Call me a cookie connoisseur, I guess. Or just a snob. I’m okay with both when it comes to this. All this being said, Christmas to me isn’t just the aforementioned sugar and cranberry/orange cookies. It’s cinnamon rolls and snack mix and cheese and soups. I’ve written about MY food requirements for the holiday, but I really want to find some new baking traditions for me and Joe to share. And since the boy doesn’t like traditional sugar cookies or peppermint anything, this might be a pretty tough order. Little balls of m-word gooiness! That sounds like potential with lots of different flavors and even boozy options to try. They also fit the requirement of being small for dessert table drive-bys. It’s also like the sister recipe to cake pops, which Robbi rocks every year. Actually, Robbi, can you just come to Utah and make those for me now that I’m craving them? Kthanks. Yum. I always forget about snickerdoodles. Bobbie baked her mom’s awesome recipe when we spent Christmas together in Florida and they really are a great holiday pick as they hum with warm spices. The key for me would be to make them really full of flavor (sometimes they can be really bland to me) and as soft and pillowy as possible, which generally leads to me under baking my cookies so much I might as well just eat the dough. That also works. Peanut Butter. The Butter of Peanuts. It’s the one thing Joe and I agree on above all else. Well, that, and a few other things mentioned in our vows. 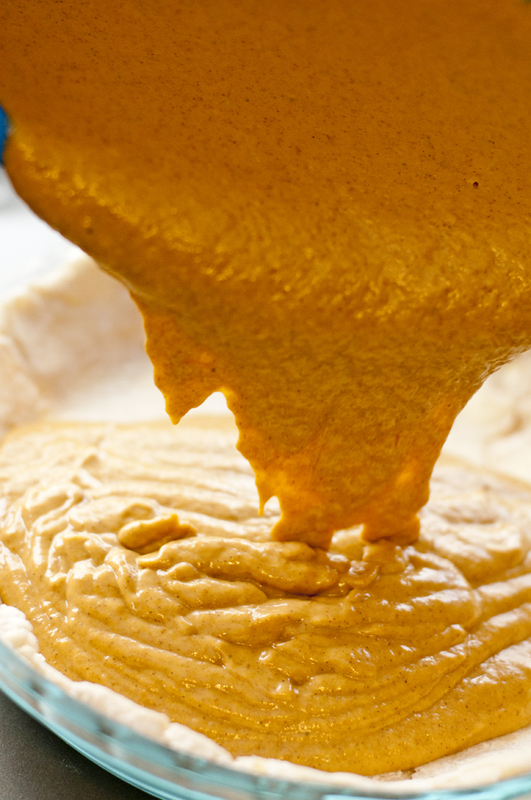 My family already has peanut brittle in the sack, so we need a new favorite peanut butter treat that screams SPECIAL! HOLIDAY! EAT ME! No fork crisscross marks here. Joy the Baker features amazing looking “Chocolate Peanut Butter Ball Cookies” in her first cookbook. She even writes that it’s based on her mom’s Christmas treat tradition, Buckeyes (which I adore), but in cookie form. Yes, please, to all of the above. This is Joy’s recipe (with the addition of a questionable powdered sugar glaze), but here’s another similar one which looks more our style. What if I could find a different variety of cookie? One we can both agree on? Worth a shot for the sake of our marriage. I mean, I’m always one to take one for the team…especially when it comes to baking. These peanut butter roll-out cookies could possibly fit the bill. And, even though they are covered in powdered sugar (typically a big Marci no-no), I’ve heard these crinkle cookies are quite the bite. In breaking the hand-held requirement, what about a holiday ice cream? Too much cold? Or a pie? I need to keep working on my pie skills, especially in this altitude. What about a pie in bar form? Cheesecake bars? Or what about cinnamon and sugar dusted soft pretzel bites? What am I not considering? So, dear readers, what should I do? I’m thinking of making small, no—tiny, batches of a few things to have for us to nibble on for, you know, a day or two. What do you recommend? What will you be making? 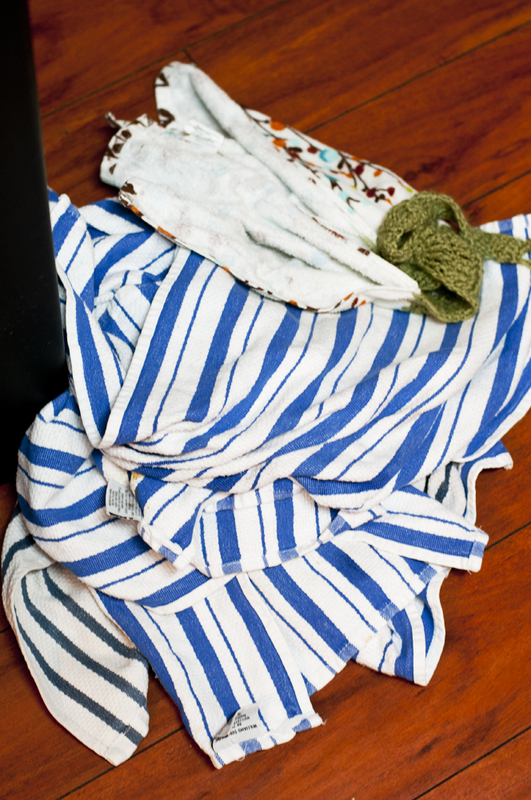 What are your can’t-live-without items? Put on your stretchy pants and let’s talk about the marathon-eating adventure that was our week of Giving Thanks. I always try to pick recipes I can make in advance, so the cooking party started early on Tuesday with me making this favorite ice cream by Jeni’s–Salted Vanilla Custard–to have over pies. I also made a big batch of a special sauce to pour on top, but I’ll get to that later. On Wednesday, I made homemade vegan gravy that was incredible. Here are the vegetables simmering away, concentrating their goodness after already being roasted. It had such a deep flavor, especially with the quarter-cup of red wine and tomato paste added to it. 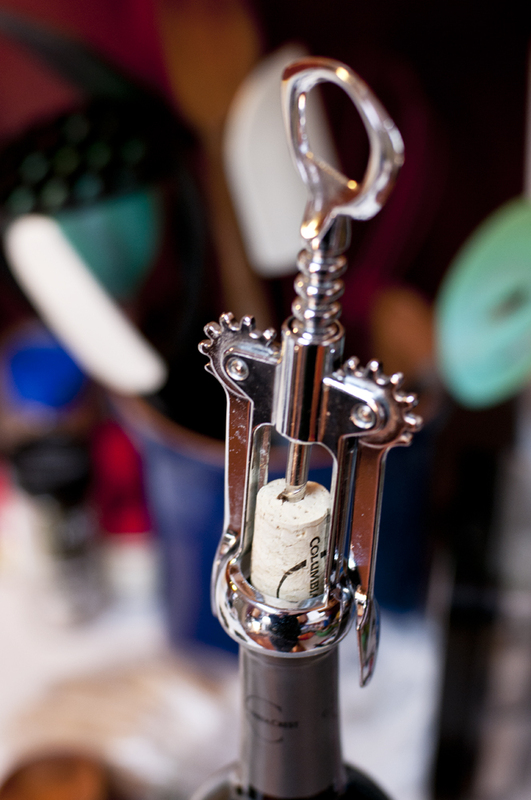 Isn’t it a shame when a recipe *only* needs a little bit of wine? I mean, what else could you POSSIBLY do with the rest of that bottle? 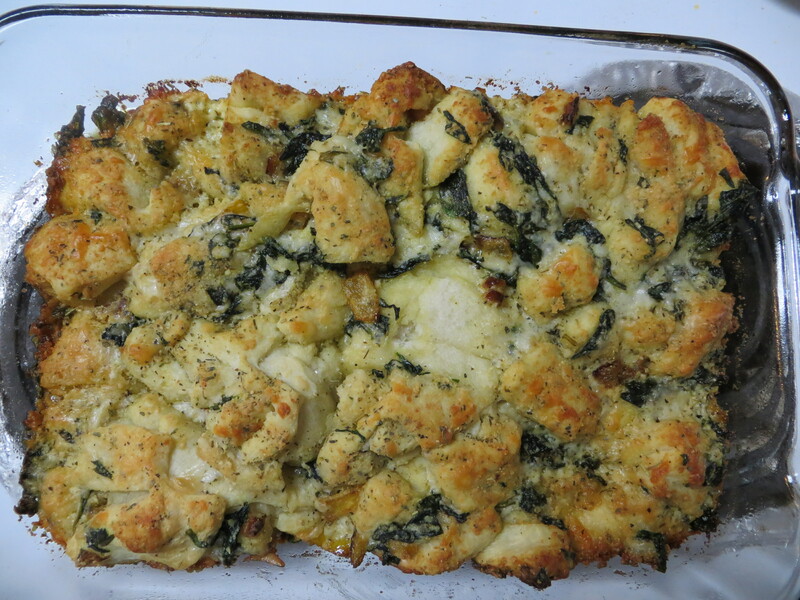 We also prepped a savory Leek and Cremini Mushroom Bread Pudding that I was taking as a vegetarian dressing option. Barefoot Contessa strikes again with this in-cred-ible recipe. 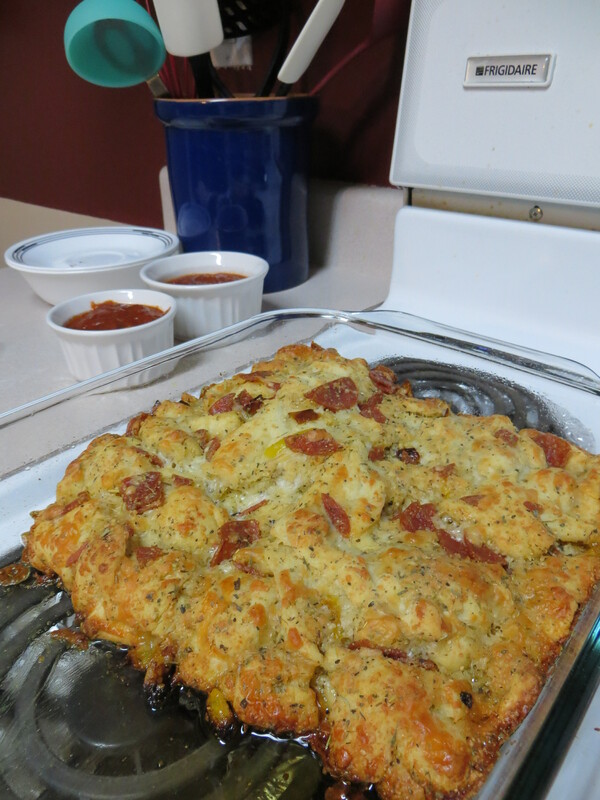 All I had to do the morning of was soak the bread with the vegetables and about a gallon of cream before baking. Total cinch. Especially to the waistline. 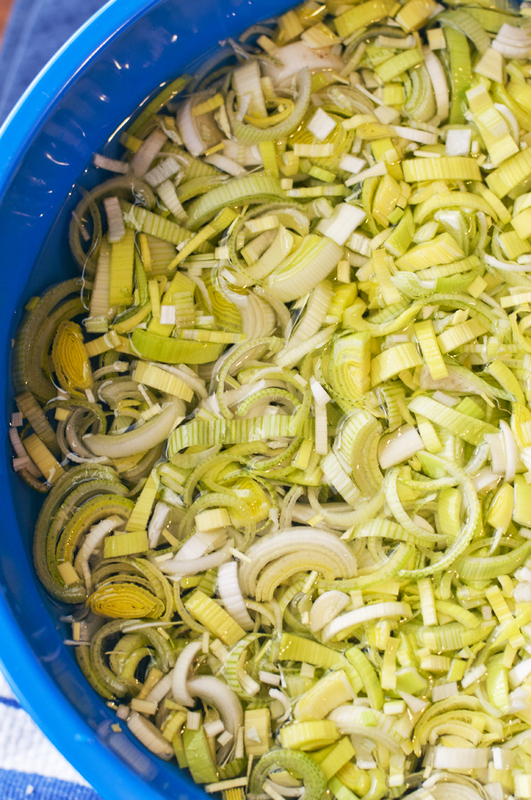 For those that aren’t familiar with leeks, this is how you de-grit them — a nice icy bath. Those suckers come at you dir-tay from the store. 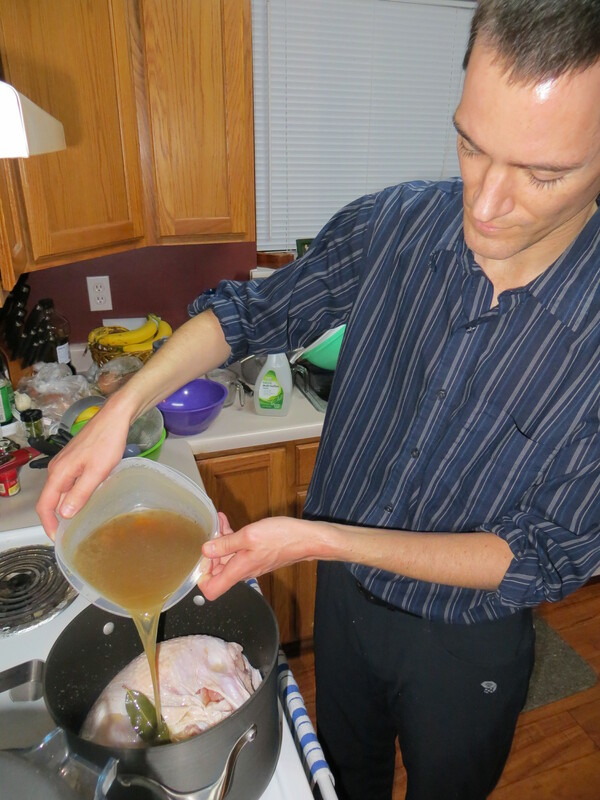 We also had time to prep a few recipes for us to leave at home, namely Joe’s turkey. I’m always amazed people know what to do with turkeys. They seem out of control to me, legs flying everywhere, and that pimply skin? Nothankyou. Please notice the cleaning spray in the background. That would be me, the resident vegetarian, following my husband like a shadow cleaning every surface he MIGHT have touched while prepping the turkey. Even when I was a meat-eater, I’ve always hated turkey…followed closely by pork chops. 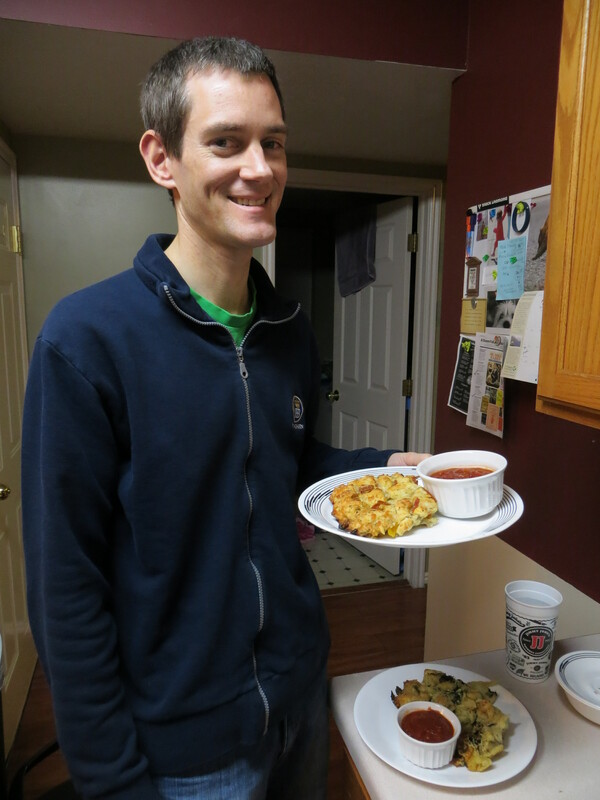 This year I had a downright hankering for green bean casserole. I’ve made it from scratch several times, but I wasn’t wanting a thick, salty roux and crisp panko crumbs. I wanted Campbell’s to wrap me in a thick paste of processed comfort, heavy on the french fried onions too. So, I made that in advance as well. Don’t judge me. You can take the girl outta Oklahoma, but you can’t take the Oklahoma outta the girl. At this point, I realized we had to stop cooking. Not because my feet and back ached, or because my hands were completely dry from washing them so many times….but because I literally went through every single dish towel in the house. It was time to run some laundry and get ready for the actual day! After doing about 85% of the work in advance, I actually got to….wait for it…sleep in! Well, a little bit at least. It was a relaxing morning with the parade in the background and a texting fiesta with my OGE bestie, Trent, about everything we were cooking or about to consume. The last thing I had to make were Brie Bites. Now, you know about my love affair for Baked Brie at Thanksgiving. It’s my only requirement. I have it every. single. year. But, this year I shook it up a bit by making baked brie bites. 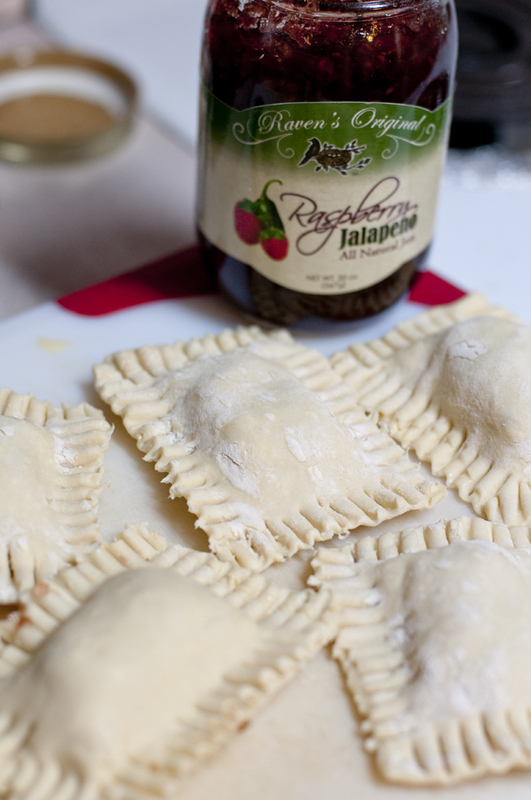 Little pockets of puff pastry filled with brie slices and either herb cheese spread (like Boursin) or Raspberry Jalapeno jam. Shut the front door. While they were easier to eat and just as delicious, I think I prefer my tried and true recipe. It’s the cheese to pastry ratio, you know? Sometimes you just need three times as much cheese as you do pastry. I’m sure you understand. These were great, though, for their portability and easy finger-food option. There were 13 of us at Chris and Chilali’s this year. Isn’t that incredible? 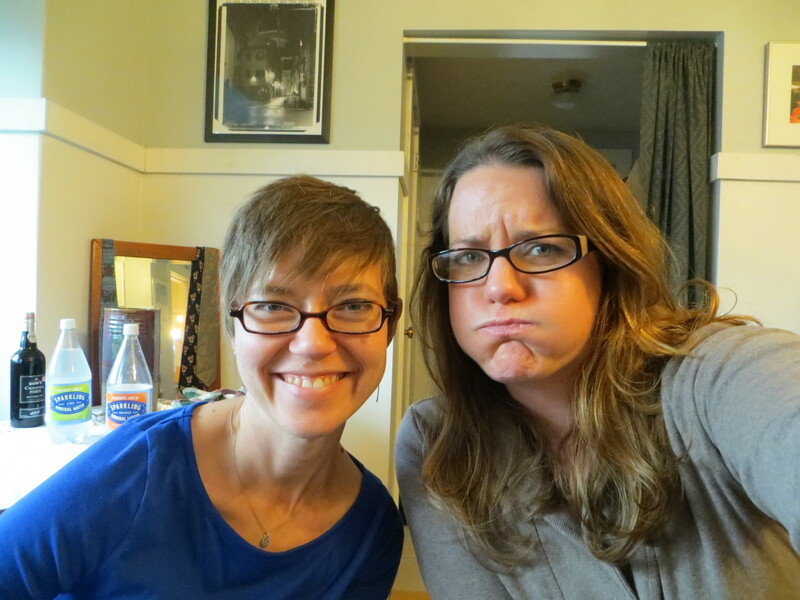 I know I’ve already told you about C&C, but they really are the most amazing hosts. And damn good cooks. 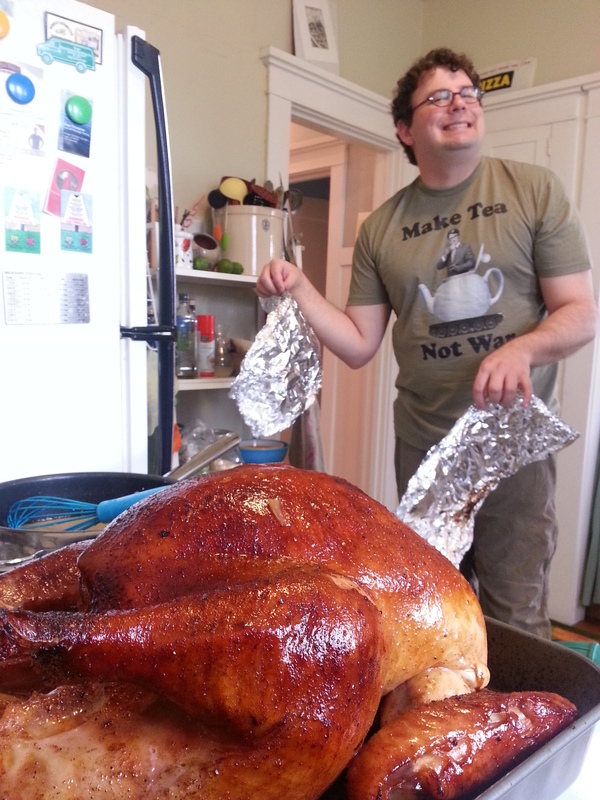 Here’s Chris with his Brown-Sugar-Crusted turkey….and his Make Tea, Not War shirt. We spent most of the pre-eating time squished on a couch with good friend Jason, eating the most wonderful cheeses…and those tasty brie bites. 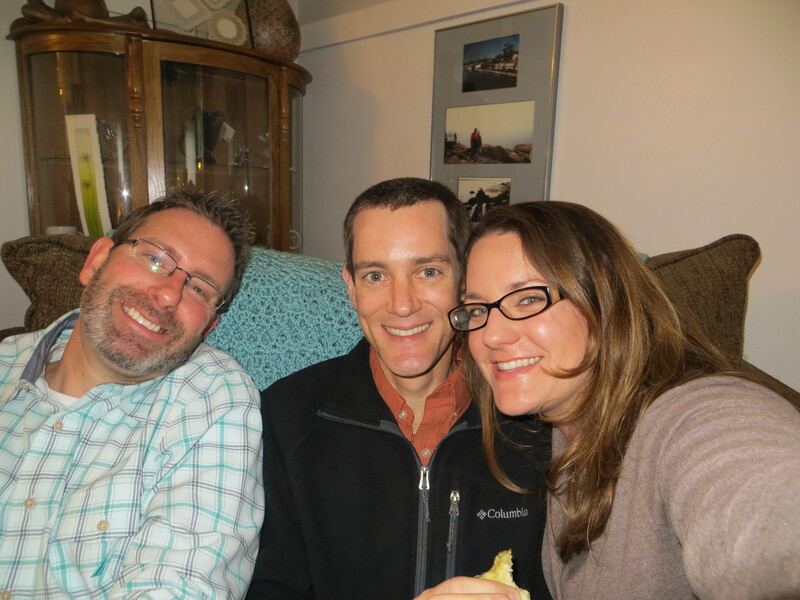 It was an all-adult holiday, except for this guy, who I hadn’t seen since our running adventures! Love him! That’s quite the pose, Harrison. 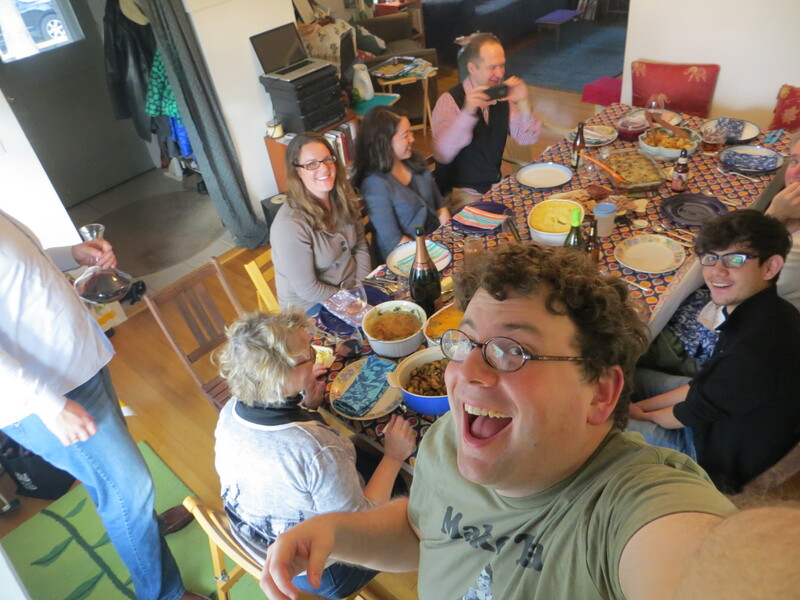 I don’t think we were successful in getting a group photo, but here are a few from the table including an epic selfie by Chris. 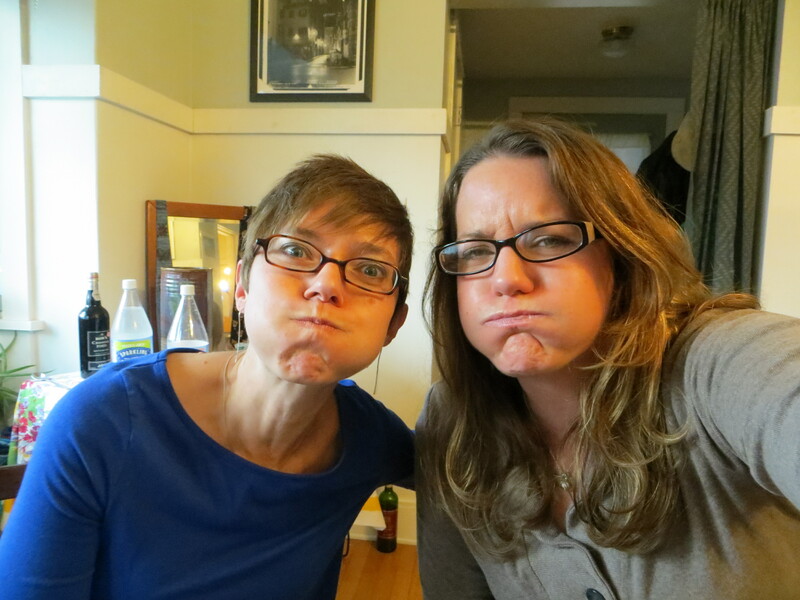 After, I told Chilali we should document our “full faces.” I guess I should have been more clear. That’s more like it! This girl’s the best. And I pretty much made that face until the next morning, where I promptly had green bean casserole before playing two Nutcracker shows. And, oh yeah, cleaned up after my dog all day. You remember, I know. 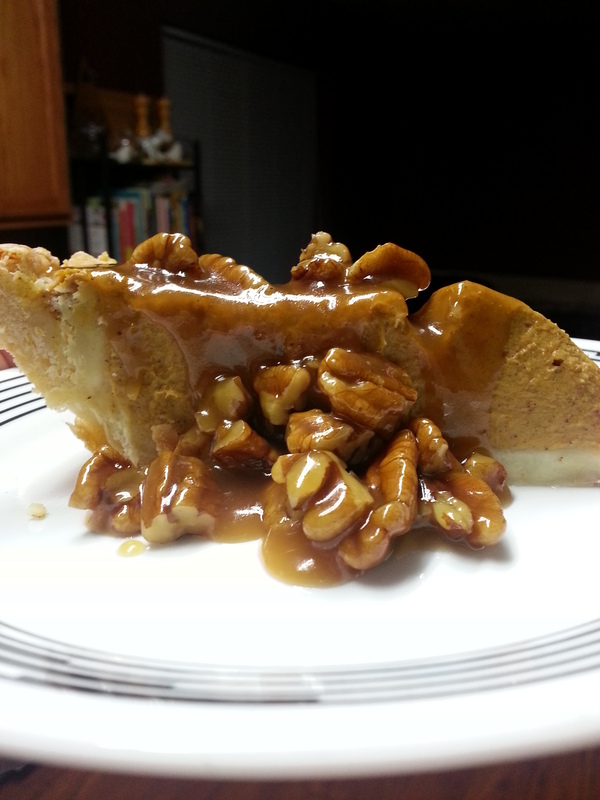 On that note…more soon with that delicious pie and sauce I keep teasing and taunting you with random mentions. It really was the best thing I ate all week, which is saying a lot after recapping all of this deliciousness. I leave you with the recipes and a full heart that tomorrow’s Friday and hope that normalcy returns around here for us and the pup. Tune in to ESPN on Saturday, December 20th at noon (Mountain Time)!